One of the most puzzling themes in the New Testament is the idea of embracing personal weakness as an opportunity to experience God's power. Jesus taught that being last of all and servant of all leads to exaltation, denial leads to salvation, losing life leads to finding life. Paul wrote of being a broken vessel that demonstrates God's transcendent power. His thorn became the testimony of God's all-sufficient grace, so that he boasted in his weakness. Peter wrote of rejoicing in a fiery ordeal. Etc. History is full of stories of Christians who have found a deeper faith through unimaginable suffering. Either as the sufferer or as a witness to suffering, they emerge with a testimony of gentle and humble trust in God. They have discovered by personal experience, not second-hand, that God is trustworthy and completely dependable. He heals and restores all the lacerations life can inflict upon us. And what of those former wounds? Our tendency is to attempt to cover them up as if we never had the weakness in the first place. We try to project and protect a myth of total success. We desperately need God's healing touch, but want to live as if it was an addendum to a well-ordered life and hardly a daily necessity. God has a different idea of what to do with our former wounds. I recently learned about a Japanese technique of repairing broken pottery called kintsugi. Instead of trying to repair the vessel so that it appears to have never been broken, kinstugi practitioners piece it back together with lacquer then dust the cracks with gold. Instead of disguising the breaks, the beautifully repaired golden lines testify to the history of the object and its renewed usefulness. Each of us carries a number of flaws and breaks from life. However, God's tender touch brings all of our broken pieces back together. 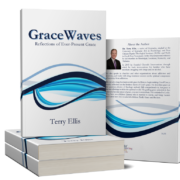 Grace highlights His healing, and thus we become living testimonies of how God has worked in our lives. The scabs from former wounds become scars, fully healed, but glowing with the glory of heaven. And they need not be hidden! Hurting people need to know that God heals all wounds. God only repairs what we allow Him to have. Try placing the broken pieces of your life, your pain, bitterness, fear, and doubt in His hands. And trust the people He places in your life. They may be part of your healing.